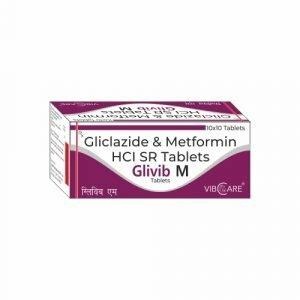 Gliclazide is an oral antihyperglycemic agent used for the treatment of non-insulin-dependent diabetes mellitus (NIDDM). It belongs to the sulfonylurea class of insulin secretagogues, which act by stimulating β cells of the pancreas to release insulin. Sulfonylureas increase both basal insulin secretion and meal-stimulated insulin release. Medications in this class differ in their dose, rate of absorption, duration of action, route of elimination and binding site on their target pancreatic β cell receptor. Sulfonylureas also increase peripheral glucose utilization, decrease hepatic gluconeogenesis and may increase the number and sensitivity of insulin receptors. Sulfonylureas are associated with weight gain, though less so than insulin. Due to their mechanism of action, sulfonylureas may cause hypoglycemia and require consistent food intake to decrease this risk. The risk of hypoglycemia is increased in elderly, debilitated and malnourished individuals. Gliclazide has been shown to decrease fasting plasma glucose, postprandial blood glucose and glycosolated hemoglobin (HbA1c) levels (reflective of the last 8-10 weeks of glucose control). Gliclazide is extensively metabolized by the liver; its metabolites are excreted in both urine (60-70%) and feces (10-20%). For the treatment of NIDDM in conjunction with diet and exercise. LD50=3000 mg/kg (orally in mice). Gliclazide and its metabolites may accumulate in those with severe hepatic and/or renal dysfunction. Symptoms of hypoglycemia include: dizziness, lack of energy, drowsiness, headache and sweating.